What They Say....Fiona Davis's stunning debut novel pulls readers into the lush world of New York City's glamorous Barbizon Hotel for Women, where a generation of aspiring models, secretaries, and editors lived side-by-side while attempting to claw their way to fairy-tale success in the 1950s, and where a present-day journalist becomes consumed with uncovering a dark secret buried deep within the Barbizon's glitzy past. When she arrives at the famed Barbizon Hotel in 1952, secretarial school enrollment in hand, Darby McLaughlin is everything her modeling agency hall mates aren't: plain, self-conscious, homesick, and utterly convinced she doesn't belong—a notion the models do nothing to disabuse. Yet when Darby befriends Esme, a Barbizon maid, she's introduced to an entirely new side of New York City: seedy downtown jazz clubs where the music is as addictive as the heroin that's used there, the startling sounds of bebop, and even the possibility of romance. Over half a century later, the Barbizon's gone condo and most of its long-ago guests are forgotten. But rumors of Darby's involvement in a deadly skirmish with a hotel maid back in 1952 haunt the halls of the building as surely as the melancholy music that floats from the elderly woman's rent-controlled apartment. 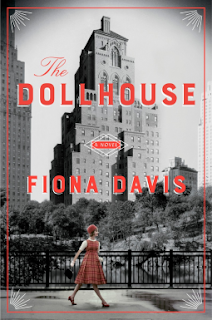 It's a combination too intoxicating for journalist Rose Lewin, Darby's upstairs neighbor, to resist—not to mention the perfect distraction from her own imploding personal life. Yet as Rose's obsession deepens, the ethics of her investigation become increasingly murky, and neither woman will remain unchanged when the shocking truth is finally revealed. What I Say....Whenever you read an author's first novel, it's always a crapshoot. It usually takes most writers a book or two to find their voice. I'm happy to say that was not the case with The Dollhouse. I really enjoyed reading this book. Darby was a heroine that you rooted for. So new to the city, and unsure of herself or what anyone's motives are for being nice (or mean) to her. She is placed on the flourish all the models, some of who seem to be kind and some who seem to be mean, she makes a friend in the maid, who seems to be kind, but is also pulling her into a life that might derail her plans to complete secretarial school and support herself. Darby meets a boy that shows every sign of being interested in her, but her self confidence is so low, she is embarrassed to even entertain the thought of a romance. Darby's choices cumulate in a death - but we spend most of the book wondering who died and who lived when the conflict hit its peak. This story has been buried since the '50's and all the surviving players have moved on, living quiet lives. But Rose is a real journalist who is trying to impress her new young boss that only wants clickbait stories. She's also dealing with her relationship falling apart when her boyfriend decides to reconcile with his ex-wife "for the sake of the kids". Her impending homelessness and disintegrating career are the impetus for Rose's pursuit of Darby's story, even when Darby shows no interest in having her story told. The storyline bounces back between the jazz clubs of the 50's and today, but in a way that works.